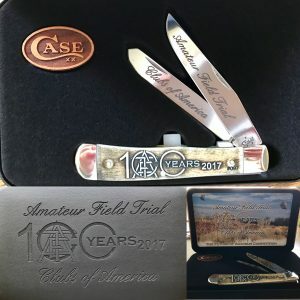 The collector 100th AFTCA Anniversary knife is now available through the 20th Century Fund. The purchase price of the knife is $175.00 or any amount over $175.00. Help celebrate the 100th year of the AFTCA. All proceeds with go to the 20th Century Fund. The 20th Century Fund has granted out over $200,000 to member clubs over the years to help with habitat improvement. $21,000 was granted this year alone. This donation is tax deductible to the extent provided by law, under the Amateur Field Trial Clubs of America, Inc.